American travel magazine has placed three Japanese cities such as Tokyo, Kyoto and Osaka among some of the best big cities in the world. For the first time, Osaka in western Japan has been included on the list. Tokyo is at the top of this year’s Conde Nast Traveler’s Readers’ Choice Awards, retaining the place for the 3rd year in a row. Japan’s ancient capital Kyoto is ranked 2nd, up from 3rd place last year. And Osaka is ranked 12th. KYOTO, Japan – Kyocera Corporation (NYSE:KYO)(TOKYO:6971) today announced that its innovative Aquala technology received Japan’s “Prize of the Minister of Economy, Trade and Industry” during the 2018 National Invention Awards held in Tokyo June 12 by the Japan Institute of Invention and Innovation (JIII). 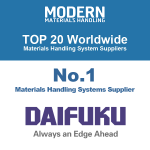 NOVI, Mich. – Daifuku North America Holding Company – the leading provider of material handling solutions – has, together with its parent company and affiliated entities, been recognized as the Number One Worldwide Systems Supplier in Modern Materials Handling’s annual “Top 20 Systems Suppliers” list. TOKYO – Washoku World Challenge Executive Committee, runs the Washoku World Challenge, a cooking contest in which Japanese cuisine chefs from around the world compete in technical expertise and passion for Japanese food, organized by the Ministry of Agriculture, Forestry and Fisheries of Japan. On Feb. 13th-14th, 2018, six finalists from 5 countries and regions gathered for the final tournament held in Tokyo, and David Israelow (private chef) from the United States won 1st Place. The second place was a tie between two contestants, Christopher Brian Massad (Tankuma Kitamise) from the United States and Daniele Codini (The Ned London) from Italy. Japan Products announced the Proud Products and Services 2017. We are very pleased to introduce these products, and these products will be highly successful to the global marketplace. Japan’s Smart Glasses Developer – WESTUNITIS CO., LTD. The layered superconducting material is characterized by a crystal structure in which a SnAs layer (wherein Sn and As are two-dimensionally bonded to develop superconductivity) and a Na layer (the spacer layer) are alternately laminated. Considering that such a layered structure is similar to that of a cuprate- or iron-based high-temperature (high-Tc) superconductor, it is possible that in SnAs-based layered materials, superconductivity is developed as a result of the unconventional pairing mechanism. A Japanese whisky has won the world’s top prize in a prestigious contest in Britain for the second straight year. The organizers of the World Whiskies Awards chose the “Taketsuru 17 Years Old” malt of Japan’s Nikka brand as the best blended malt whisky for 2015. Tokyo, August 20, 2014 – Fuji Heavy Industries Ltd. (FHI), the manufacturer of Subaru automobiles, today announced that the Insurance Institute for Highway Safety (IIHS; a nonprofit organization supported by auto insurers in the US) has awarded the highest standard of safety, 2014 TOP SAFETY PICK+ (TSP+) along with the highest possible rating of “Superior” for front crash prevention to the all-new 2015 Subaru Legacy and Outback, equipped with Subaru’s new version of EyeSight driving assist system and sold in the North American region from this July. Source: Asahi Kasei Chemicals Corp.
Asahi Kasei Chemicals received the 2014 Heroes of Chemistry Award from the American Chemical Society (ACS) for the technical development and commercialization of the world’s first non-phosgene process for polycarbonate (PC), marking the first time a Japanese company has received this prestigious award. The award ceremony was held on August 10 (US Pacific Time) as part of the 248th ACS National Meeting & Exposition in San Francisco. Each year the Pritzker Architecture Prize goes to a star architect with a long list of glamorous commissions around the globe. This year’s winner is a little different. Shigeru Ban has designed museums, homes and concert halls. But Ban is best known for a more humble kind of work: The temporary structures he’s built for refugees and evacuees all over the world. Associate Professor Kenji Kabashima (Department dermatology, Graduate School of Medicine), and Postdoctoral fellow Atsushi Otsuka (Innovation Center for Immunregulation Technology and Therapeutics ：AK project) found the compound to regulate atopic dermatitis via upregulating filaggrin expression.